Quick to erect on both grass and hard surfaces. Peaked roof to protect artist from rain. Size 9.7 M wide, 6.1 M deep and 4.8 M high . 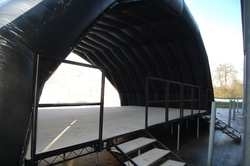 Steeldeck raised stage platform . Constructed of 2.4 m x 1.2 m steeldeck units. Max stage size with this canopy is 9.6 m x 4.8 m.
Stage performing height of 1 m.
Stage can be erected on both uneven grass or hard surfaces . Access stairs to stage supplied. Ramps for disabled access are available . Front of stage can be fitted with either a plinth or advertising banner.